For many Holi is not just a festival of colors but an occasion to revel in ‘Bhang ki Thandai.’ Bhang is made from the leaves of Hemp and is considered to be the least intoxicating of the cannabis preparations in India. But is capable of giving a high for the entire day and is sold openly during Holi festival. Bhang ki Thandai is also given as a prasad in certain temples during the festivals. The Bhang usually comes in two varieties – capsule, dried Bhang leaves and dried plant. The capsules or golis are added to ice cream, sweets, paan etc. The dried plant or leaves is soaked in water and then it is cleaned and finally grounded on a stone slab to get the paste which is taken along with Badam milk or any sweet preparation. The sweet and the Bhang are considered to a highly potent combination and is said to give a real high. 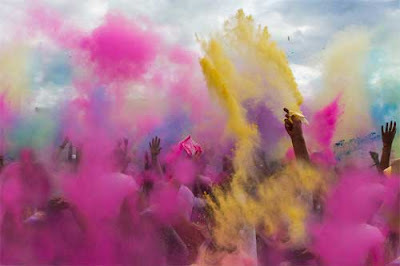 Therefore many revelers wait for Holi to get intoxicated in public. For fun, many people are also fed bhang mixed drinks and sweets without their knowledge. Sale of Bhang during other days is prohibited in many places except in some temples and places associated with Lord Shiva.